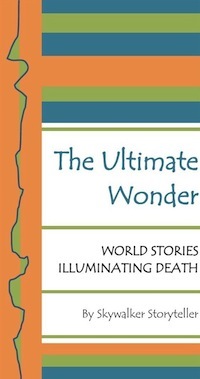 I wrote The Ultimate Wonder, World Stories Illuminating Death, as a result of my series of audio stories. My goal is to share these stories with everyone in order for death to be seen as the last wonder of life rather than as the grim reaper. This is an e-book available on all of the major e-book retailers. Followers of this blog and subscribers of my site newsletter will receive different opportunities to receive free PDFs in the next few weeks. Until that time you may read a review press release on my site – http://www.skywalkerstoryteller.com/reviews/ I trust the review will encourage you to read and review the book yourself. Big congratulations to you, Sky! Another book in your name. I sure believe it will be a wonderful read. Been a while since I’ve gotten over here, and busy you’ve been. I’ll have to take some time. How’s Homer treating you, Sky? Off to check out the review..
Homer is treating me well.